The Soda Fountain Plastic Custom Tumbler with matching straw. A great new look for one of our most popular travel mugs. 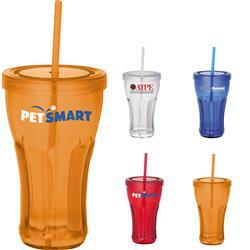 Single-wall tumbler with twist-on lid and matching straw. 16-oz and BPA Free AS plastic with polypropylene straw. Comes in Red, Blue, Smoke, Clear, Green and Purple! 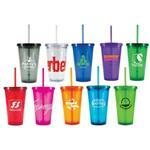 A RUSH PROMOTIONAL TUMBLER - FREE 1 DAY RUSH PRODUCTION AVAILABLE! Production Times Available: 5 working days standard. FREE 24 HOUR RUSH! Available Imprint Options: Please add $.45 per mug for each additional imprint color. BPA free plastic tumble, 16 oz., BPA-free AS plastic with polypropylene straw, Packaging: Bulk Packed.